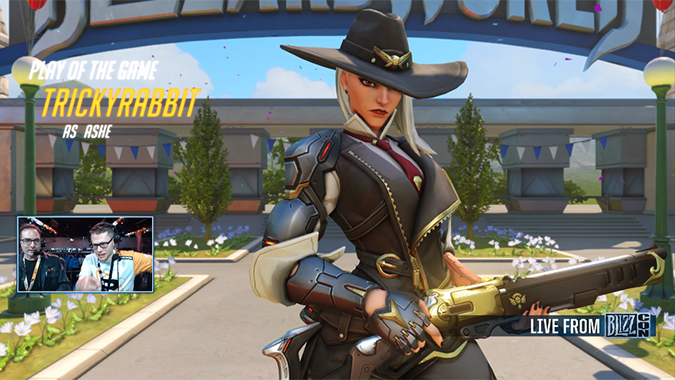 Overwatch’s new hero Ashe has a ton of new abilities that everyone will be able to test out soon when she goes live on PTR, but, thanks to Emongg’s Twitch.tv stream with Game Director Jeff Kaplan we now have a good idea of how she works. Let’s break Ashe down to her most basic kit. She has her hitscan-damage rifle that shoots semi-automatically unless scoped in like Widowmaker. The damage is increased when she’s scoped in, and she reloads the individual shots so you can break the reload animation to shoot before it’s fully finished. She’s packing a left-handed shotgun ability (note: not a repeatedly fire-able gun) that deals damage and knocks both enemies and herself back. She also has Dynamite that can be tossed far into the air that will detonate after a set amount of time — or can be shot to explode faster. It sets enemies on fire too! Both of her abilities are on 10 second cooldowns so you need to be careful with how you use them. Her ultimate features her butler B.O.B. who will run forward in front of her, knock enemies upward, and then turn around and shoot like a turret. B.O.B.’s knockback is just like Doomfist’s Uppercut which prevents aerial movement — so it’s like a vertical stun. He also has 1,200 health and is susceptible to what looks like anything that could happen to a playable hero: he can be Nano Boosted, damage boosted, slept, stunned, and frozen. He can also contest and capture objectives! It looks like he lasts about six seconds which should help make up for his immense health pool. Overall, Ashe seems to sit in a similar damage role that McCree and Widowmaker do. She has fast vertical and horizontal mobility but no stun to prevent fast heroes from punishing her. Her damage output looks to be somewhere between McCree and Widowmaker, which means she can’t quite one-shot kill, but can definitely burst people down quickly. Her biggest weakness looks like close range since she only has 200 health and can’t escape heroes like Genji or Hanzo very well. I can see her being played by skilled players who can aim well and make use of the AOE Dynamite. A lot of her abilities revolve around her ability to hit precise shots. Her ultimate doesn’t seem as devastating as Soldier 76’s Tactical Visor or McCree’s High Noon, especially because it can be shut down in various ways, but it should do a lot for area denial. Jeff said she’ll be hitting the PTR servers very soon and we’ll definitely play her over on our Twitch as soon as she’s live.